World's most popular pear. Early mid-season, high quality, tolerates hot summers. Estimated chill requirement: 500 to 600 hours. Self-fruitful in arid West. Elsewhere, pollenized by Bosc, D'Anjou, Winter Nelis. A distinct blend of sugars, acids and other flavors give Blake’s Pride a rich, aromatic taste. This yellow and light-golden pear was developed by horticulturalist Richard Bell with the ARS Appalachian Fruit Research Station in Kearneysville, West Virginia. This excellent eating pear also is resistant to fire blight. Ripens 10 to 14 days after Bartlett. Long & narrow shape, brown skin. Superb quality, one of the best. Harvest late October. Fresh/cooked. Susceptible to fireblight in warm, moist climates. Estimated chill requirement: 500 to 600 hours. Pollenized by Bartlett or other pear. The gift pack pear. Sweet, aromatic, fine texture, superb flavor and quality - one of the best. Short neck, greenish-yellow skin with red blush. Late harvest. 600 hours. Self-fruitful in arid West or plant with Bartlett. Large, short-necked, firm, good quality, keeps well. Harvest September 1st, one month after Bartlett in Central California. 800 hours. Pollenized by Bartlett. Ripens to a light green. Flesh texture is moderately fine and buttery. Pleasingly subacid flavor with a mild aroma. Tree shows more resistance to fireblight than Seckel. Developed by the USDA and Ohio State University. Connoisseurs' favorite. Sweet, flavorful, spicy, aromatic, perhaps the best. Russeted brown skin. Resists fireblight. Estimated chill requirement: 500 hours. Self-fruitful in arid West. High quality Bartlett-type fruit with attractive red skin. Relatively small tree. 700 hours. Self-fruitful in arid West. Elsewhere, pollenized by Bosc, D'Anjou, or other pear. 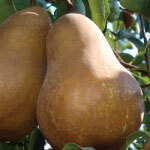 Excellent quality dessert pear - and highly resistant to fireblight. Medium to large, long-necked fruit with pale green skin, sometimes blushed red. Smooth flesh (no grit cells) is juicy and buttery with superb flavor. Good keeper. Cold hardy to -20°F. From Mississippi. 600 hours. Self-fruitful.